He is one of few people who was able to merge the old ways of healing with the new. Conversations with him are always exiting because he always describes the human body as something wondrous. And, since I was a kid, he always told me secrets for healing the human body. There is Yin and Yang energy that flows through us. The flow of this energy is necessary for good circulation and health. Sometimes emotional and physical trauma suppresses the flow of energy and in order to return harmony we need to manipulate the flow of these energies. Here is a particularly interesting way to benefit your body that doesn’t take too much effort or time. You’ll notice that some of these movements and massages come naturally to our bodies when we feel the need to subconsciously improve our energy flow. 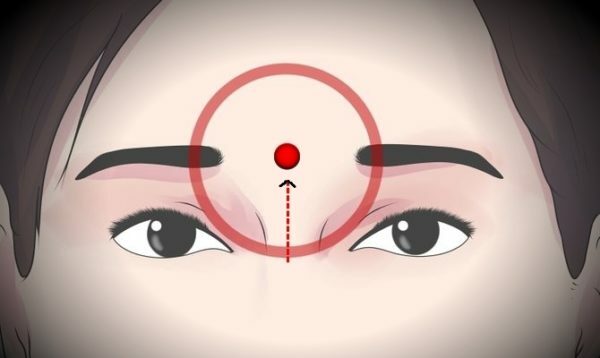 Applying upward pressure to this point on the forehead improves concentration, releases tension, relieves headaches, and can also benefit your eyes especially if you are long time of the day in front of a computer. According to Traditional Chinese Medicine and acupressure doctors, massaging this point strengthens the intuition of an individual. With a gentle pressure starting from the GV 24 (The Third Eye) point, stroke this place upward to 3 inches above in a vertical line. Apply upward pressure to this point for 45 seconds – 1 minute and you will notice the benefits. Yang energy, unlike Yin, begins in the head and flows downward to the rest of the body. That’s what you are working with when you massage this point on your head.